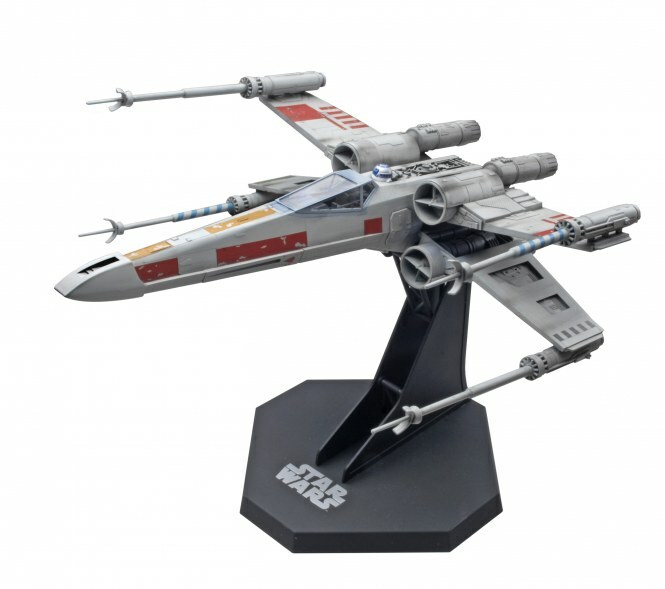 This is the Revell 1:48th scale X-Wing Fighter from Star Wars. It is part of the Master Series range which is based on the famous Fine Molds kit, the most accurate kit ever built of this subject. This is the most important rebel alliance fighter and one of the most powerful single-seat space ships ever produced. The T-65 X-wing Fighter owes its name to the double wings one above the other that form an X in combat in order to increase the firing range of the pilot. In addition to four high-energy laser cannon the X-wing Fighter has proton torpedoes, deflector shields, hyper drive and a navigation droid. Luke Skywalker prefers this type of fighter. It was used by the young Jedi to destroy the first Death Star in the Battle of Yavin. The X-wing Fighter quickly proved to be one of the most effective military aircraft in the galaxy. The unusual wing design of the T-65 is frequently regarded as the success formula of the space ship. The pair of twin wings remains closed during normal flights under the speed of light. In combat and on entry into the atmosphere of a planet, they can be extended. On the wing tips are high-energy laser cannon that can be fired singly, simultaneously, in pairs or in other combinations. Construction kit for the advanced modeller. 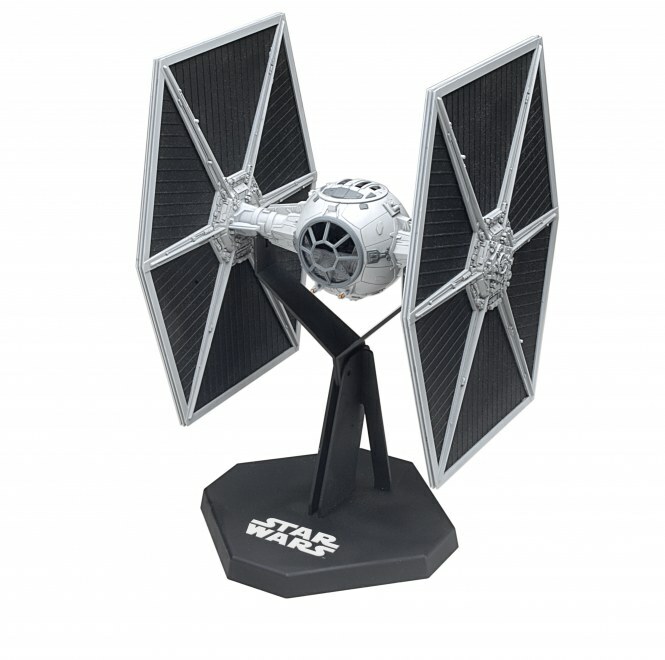 This is the Revell 1:48th scale TIE Fighter from Star Wars. Darth Vader used this prototype as the basis for the terrifyingly effective TIE interceptor in the Battle of Yavin. Unlike all other TIE fighters this prototype has a deflector shield generator and a simple hyperdrive. Vader's TIE Advanced is armed with heavy twin blaster cannon on fixed mounts but has no life support systems. The TIE Advanced is characterised by a hull made of duralloy steel, an extended after deck and unique solar cell wings. The Tie Advanced quickly became one of Darth Vader's favourite ships. Like all the TIE ships the prototype has a drive system consisting of twin ion engines. Its solar ionization reactor is reputed to be much more powerful than that of the standard TIE fighters. The TIE Advanced has proved itself in battle, as it is capable of withstanding many direct hits. In addition the pilots' chances of survival were considerably enhanced by the incorporation of a hyperdrive system, which enables the ship to escape from hopeless battle situations. 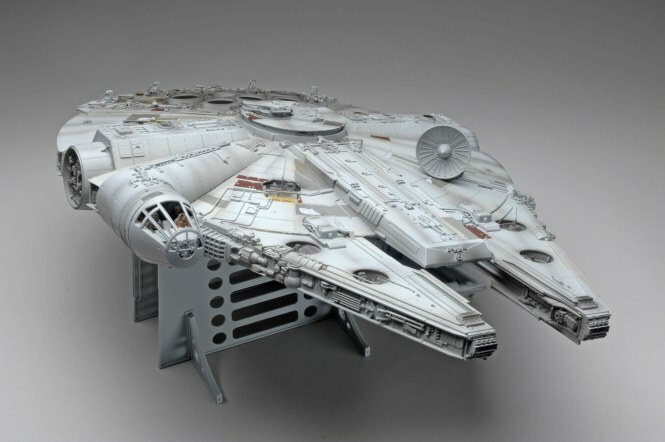 This is the Revell 1:72nd scale Millennium Falcon from Star Wars. It contains 904 parts. It is part of the Master Series range which is based on the famous Fine Molds kit, the most accurate kit ever built of this subject. This Corellian tranporter is reputed to be one of the fastest and best-equipped ships in the galaxy. The Millennium Falcon may look old and broken down, but continual modifications have made it into something special. The crew has for years consisted of the reckless pilot and smuggler become hero of the rebel alliance, Han Solo, and his co-pilot and technician, the trusty Wookiee Chewbacca. A long time ago Solo won the ship from Lando Calrissian in a game of sabacc. The Corellian transport type YT-1300 played an important role in the destruction of both battle stars and is probably the most famous ship in the galaxy. Inside the ship there is a hyperdrive that gives it almost double the speed of any imperial star cruiser. The heavily armoured Falcon has an illegal bank of sensors that can track distant imperial ships before they are aware of its presence. The ship goes into battle with the most up-to-date imperial deflector system, two quad laser cannon and two disruptors.